How do you get users to focus on the data that’s most important to them? How do you keep track of which users have access to different data fields? How do you make user management activities as efficient as possible? Folio has given us the opportunity to rethink and redesign user access in a way that better supports agencies’ needs and processes. By incorporating our user-centered design approach and our team’s years of experience supporting the eCPIC community, we’ve constructed a user access plan to maximize flexibility and efficiency. Below is an overview of the user access functionality within the new Folio data architecture. A component is anything for which an agency wants to collect data (like an investment or a project). Agencies need to provide individual users, or groups of users, with access to specific component records. Each component needs one or more templates to define the sections, subsections and fields available for users. Components are made up of individual records (component records), which are assigned a specific template. A template is a set of fields that can be accessed within a component. Templates organize fields into sections and subsections. Different component records within a single component will have different data requirements, depending on a variety of factors. Think about major and non-major investments. Both are records within the “investment” component, but have very different data requirements. Some fields overlap, but they each require unique fields as well. 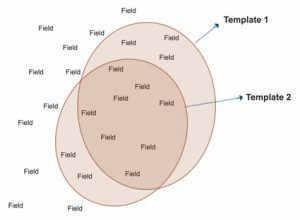 This graphic depicts the field composition of templates in Folio. 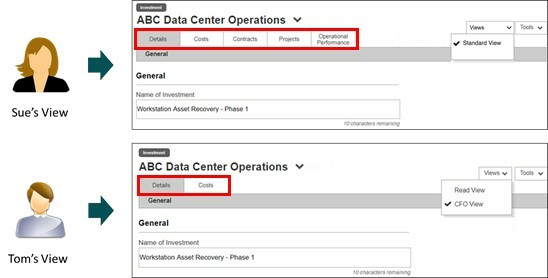 A component record for a specific investment can only use one template at a time. It cannot simultaneously use multiple templates. This ensures that all users are working with the same data set for a component record, improving data quality and overall user experience. However, since users have different roles and access needs, agencies need additional flexibility to control data access within the template. This is where “views” come into play. This graphic depicts the effect of View 1 on the fields within Template 1. The greyed-out fields represent fields hidden within View 1, and the “Read” and “Edit” denotations indicate whether the fields are editable or not. 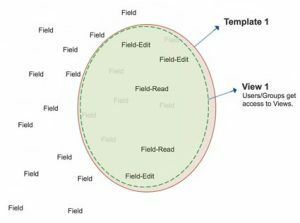 A template will always contain defined sections and subsections of fields, but a user’s view will determine which of those fields are editable or visible within the component record. For example, two users accessing the same investment may have “edit” access to different fields based on their view, while a third user may not be able to view certain fields at all. Views allow administrators to manage different access levels to the same investments for different user roles or groups. Legacy eCPIC users should be familiar with the need to create multiple processes for different user types. Folio’s views will dramatically streamline that activity, saving agency administrators a significant amount of user management time. Administrators can also assign multiple views to a single user. This is helpful for users who may play different roles on a team. This graphic depicts two users with different views of the same template. Sue has access to the standard View, which includes five template sections (highlighted). Tom has access to the CFO View, which only includes two sections. What do you think? Drop us a line at folio.pmo@gsa.gov if you have questions. In the meantime, we have begun work to incorporate other aspects of user access, such as user groups and portfolios, into this model. We will let you know what we come up with!